Discipline is freedom. You may disagree with this statement, and if you do you are certainly not alone. For many people discipline is a dirty word that is equated with the absence of freedom. In fact the opposite is true. As Stephen R. Covey once wrote, “the undisciplined are slaves to moods, appetites and passions”. And in the longer term, the undisciplined lack the freedom that comes with possessing particular skills and abilities – e.g. to play a musical instrument or speak a foreign language. In the past self-discipline has been a weakness of mine, and as a result today I find myself lacking the ability to do a number of things which I would like – e.g. to play the guitar. But I have improved, and I can say that it is self-discipline that got me out of bed this morning at 5am to run and then write this article. Believe me, I would love to be curled up in bed right now, but this desire is subordinated by my inner sense of purpose. Discipline means behaving according to what you have decided is best, regardless of how you feel in the moment. Therefore the first trait of discipline is self-knowledge. You need to decide what behavior best reflects your goals and values. This process requires introspection and self-analysis, and is most effective when tied to written expression. I highly recommend taking the time to write out your goals, dreams and ambitions. Even better, write out a personal mission statement. I found that writing such a statement gave me a greater understanding of who I am, what I am about and what I value. Dr. Covey has an excellent Mission Statement Builder on his site. As you begin to build self-discipline, you may catch yourself being in the act of being undisciplined – e.g. biting your nails, avoiding the gym, eating a piece of cake or checking your email constantly. Developing self-discipline takes time, and the key here is you are aware of your undisciplined behavior. With time this awareness will come earlier, meaning rather than catching yourself in the act of being undisciplined you will have awareness before you act in this way. This gives you the opportunity to make a decision that is in better alignment with your goals and values. 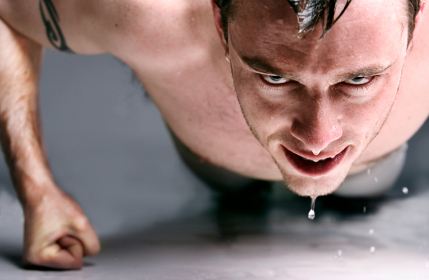 Did you notice the sweat dripping from the man in the picture at the start of this article? Make no mistake, self-discipline is often extremely difficult. Moods, appetites and passions can be powerful forces to go against. Therefore self-discipline is highly dependent on courage. Don’t pretend something is easy for you to do when it is in fact very difficult and/ or painful. Instead, find the courage to face this pain and difficulty. As you begin to accumulate small private victories, your self-confidence will grow and the courage that underpins self-discipline will come more naturally. Self-talk is often harmful, but it can also be extremely beneficial if you have control of it. When you find yourself being tested, I suggest you talk to yourself, encourage yourself and reassure yourself. After all, it is self-talk that has the ability to remind you of your goals, call up courage, reinforce your commitment and keep you conscious of the task at hand. When I find my discipline being tested, I always recall the following quote: “The price of discipline is always less than the pain of regret”. Burn this quote into your memory, and recall in whenever you find yourself being tested. It may change your life.